Do you wish you knew how to play killer rhythm guitar technique? To do this, you need to stop trying to find �cool� new riffs. Instead, you need to understand how to make every single guitar riff you play sound awesome, anytime you feel like it. You need to focus on HOW you play the notes the notes themselves. Many guitar players do not use much picking hand power when playing rhythm guitar. This generally occurs when you want to play with speed and your picking hand starts sacrificing power for speed (this makes your playing sound very weak). The best way to play with speed and power (without losing stamina) is to strike the strings hard and then immediately relax the tension after playing each particular note or chord. -Using perfect intonation on all strings while playing any chords. This is especially important if you are using multiple tracks for your rhythm guitar parts while recording. -Muting all noises during the silences that occur between notes/chords. -Playing pinch harmonics in the correct key and using vibrato (that corresponds to the rhythm of the music) to emphasize them. -Doing all of the above with impeccable timing. -Stopping all noise made by unplayed strings. -Removing the noises made while changing between chords. -Making sure you don�t accidentally play strings that are not part of the riff (or chord). The most skilled rhythm guitar players have invested tons of time into practicing and mastering all of these things. To master rhythm guitar for yourself, you�ll have to do the same. If you don�t already understand the best approaches for practicing the elements of great rhythm guitar playing, find an excellent guitar teacher to help you improve fast. 1. They haven�t studied with an excellent guitar teacher and learned how to do it the correct way. 2. They incorrectly believe that their real-life playing skills will develop on their own through simply �playing guitar more�. One of the biggest rhythm guitar playing mistakes you can make is letting your fretting hand become extremely tense while picking at faster speeds (and/or using more articulation and power). This will quickly tire you out and make playing great rhythm guitar riffs for long periods harder than it should be. To fix this issue, you must separate both hands while practicing rhythm guitar. It doesn�t matter how much force you are using with your picking hand to attack the strings - your fretting hand must only use as much tension as needed to allow the notes to sound. Generally speaking, your fretting hand has to use a lot less power and strength to fret notes than the picking hand uses to play notes. Make sure to consistently keep an eye on level the tension in your hands/arms as you play. Focus carefully when practicing to make sure that each hand uses efficient amounts of tension. In addition to managing correct levels of tension in your hands, rhythm guitar stamina is gained using specialized practicing in this aspect of playing. This practice is done to improve how long you can play rhythm guitar parts with 100% accuracy and consistency as fast as possible. 2. How fast you can play before your accuracy breaks down. 3. How long you can stay in control/accurate/tight at that speed. 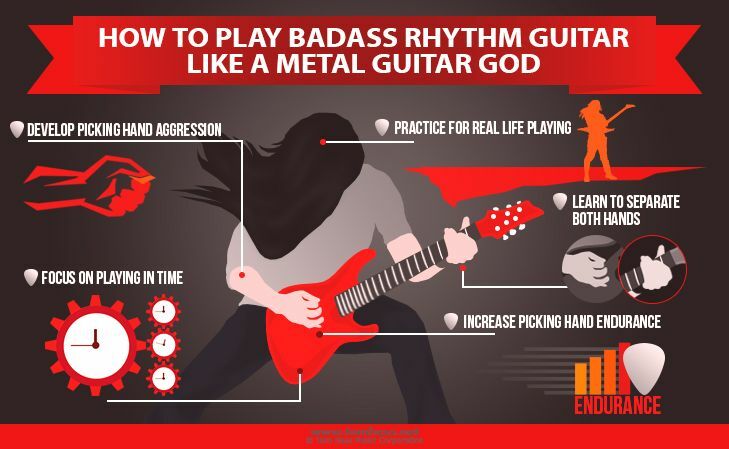 Level One: Choose a guitar riff that you want to improve stamina with, select a time goal and train to increase the speed at which you can play with 100% accuracy for that length of time without becoming tired. For instance, play the guitar riff you chose for thirty seconds without stopping at 100 beats per minute using a metronome. Then (if this is too simple), increase the metronome by several beats per minute and go for another thirty seconds. Keep going until you find a metronome speed where you cannot play accurately for thirty seconds without becoming tired. Then keep practicing at this speed until you can go for thirty full seconds. Level Two:Select a metronome speed and try to play a rhythm guitar riff for as long as you can without stopping. When you can go longer than the previous time record you set, you will know that your stamina has become better. Using these two approaches will help you quickly get better in this area of your rhythm guitar playing. You can use any rhythm guitar riffs for these practicing exercises. NOTE: If you start feeling pain during practice, don�t keep going � stop and take a break. Don�t ever play guitar while you are pain! Now that you understand the main elements you must master for playing killer rhythm guitar, test yourself to find out how close you are to mastering this aspect of your guitar playing. Take this rhythm guitar assessment to learn what you need to improve on to become a better rhythm guitarist fast.